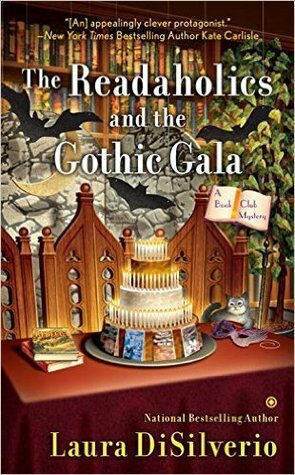 Details at the end of this post on how to enter to win a copy of The Readaholics and the Gothic Gala , and a link to purchase it from Amazon, and also one to purchase it from indie bookstore Mysterious Galaxy where a portion goes to help support KRL. As much as professional event organizer Amy-Faye Johnson loves books and reading, the Celebration of Gothic Novels seems intent on testing that affection. “Events!” has been hired by the bookstore Book Bliss to coordinate their authors’ book signing and costume party celebrating the gothic novel. To coincide with the festivities, the Readaholics bookclub has selected to read and discuss Daphne du Maurier’s Rebecca, a novel that incorporates all of the traits of gothic novel: menacing manors, sinister maids, virginal heroines, dashing heroes, missing wives, and odd children. Perhaps Amy-Fay should have predicted that fiction would bleed into reality; together the three famous gothic novelists bring to Heaven, Colorado, their own share of ego, past scandals, and violence. It had all started so promisingly, with Amy-Faye delightfully decorating the bookstore in a gothic theme and ordering book cover themed cakes to celebrate the September birthdays of the genre’s most iconic authors. It soon goes downhill when…one angry protestor accuses new author Mary Stewart (not THAT Mary Stewart, though) of plagiarism; legendary Constance Aldringham constantly belittles her husband, daughter, and most everyone else; and Francesca Bugle totes along a Hollywood producer hoping to revitalize his career. The lethally gothic twist arrives when an attendee of all the events turns up dead, with everyone denying having any connection to the victim. Knowing the Readaholics’ enthusiasm and effectiveness at investigation, Amy-Faye’s boyfriend, Heaven’s chief of detectives Lindell Hart, doesn’t stand in their way as they untangle the web of lies and discover the secrets of the authors who hide behind their celebrity images and pen names. As someone who grew up obsessed with the work of Victoria Holt, Phyllis Whitney, and Barbara Michaels, this third in the Book Club series proved to be an absolute delight. Many mysteries have used book signings and combative authors as settings for murder, but by adding the gothic element DiSilverio weaves in a surplus of surprises to ensure a completely unpredictable conclusion. The romance between Amy-Faye and Hart progresses slowly, but enjoyably, and there is definitely a lot of smoldering involved. The author deftly intersperses moments of Amy-Faye’s event planning assignments with glimpses into the personal lives of the Readaholics, and they are refreshing without distracting from the main plot. The real achievement is that this author of five mystery series will have readers enthusiastic to delve into Rebecca, a novel whose themes are reflected throughout. Readers will be as eager for the Readaholics’ next book selection as they will the next installment of this reliably fun series that celebrates the love of reading. To enter to win a copy of The Readaholics and the Gothic Gala, simply email KRL at krlcontests@gmail[dot]com by replacing the [dot] with a period, and with the subject line “gala,” or comment on this article. A winner will be chosen September 3, 2016. U.S. residents only. If entering via email please include your mailing address, and if via comment please include your email address. You can use this link to purchase this book from Amazon. If you have ad blocker on you may not see the link. Thanks for a chance to win a copy of Readaholics and the Gothic Gala. Sounds interesting. I have really been wanting to read this book…it sounds great. Thank you for the chance and I too love gothics. This is a great title. I remember reading gothics many years ago. Me and my mom. Hmmmm – dabbling into the Gothic world, somewhere I usually don’t go but am willing to give it a try! This introduction has given me an interesting problem. I normally am not a fan of Gothic (I used to be and I still love Barbara Michaels’ books), but this just sounds too much fun to pass. I would love to win this book. And when it gets down to it, no honest reader could say they did not love Rebecca. I really enjoy the Readaholics, and Rebecca is the perfect choice for a gothic novel. This book sounds wonderful! Sounds like a fun read and an interesting group of characters! Thanks for the chance! I really enjoyed the first 2 books in this series so I’m looking forward to reading this one! Oh, I would so love to get a copy of this book. As a fan and writer of Gothics, this is right up my alley! Thanks bunches for the chance. I just read the first book in this series and can’t wait to read more! Would to win this ,love new series. This sounds like a great series and I would enjoy reading “The Readaholics and the Gothic Gala”. Thanks for the chance. Thanks for the chance to win the new book in one of my favorite series. Thanks for offering this! I would love to win!! Wow, this sounds like a great read!! Readaholics looks like a sure winner to me. Smart man Detective Hart. Let the ladies do most of the work. On my TBR. Am looking forward to this. Hope to read sooner. Rather than later. Thank you for the heads up and the chance to read it sooner. This sounds great! Thankyou for the opportunity!